Having trouble viewing this email? See it online. Feel the difference on TouchPad. Connect, play, surf, and share like never before.1 TouchPad works like nothing else, and it won’t be long before you can get your hands on one. 1. Within wireless coverage area only. Actual speeds may vary. Email, mobile number, and related information required for setup and activation. Required data services sold separately; unlimited plan recommended and may be required. Wi-Fi within range of 802.11a/b/g/n Wi-Fi network. Some Wi-Fi hotspots may require fee for usage. © 2011 Hewlett-Packard Development Company, L.P. The information contained herein is subject to change without notice. Not all apps available on all devices. All screen images simulated. 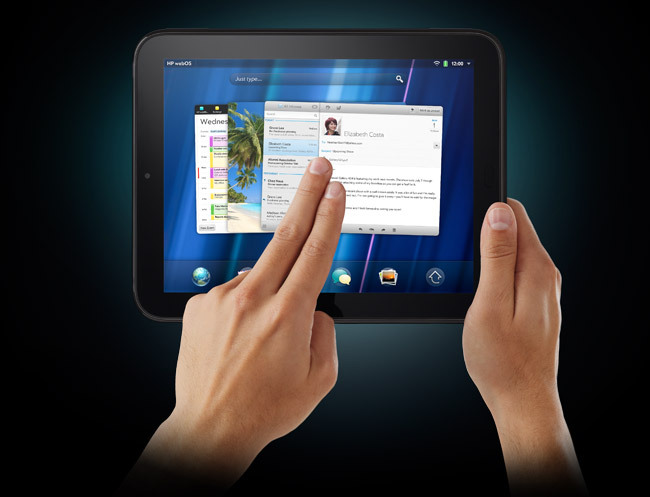 You are receiving this message because you requested to receive information about upcoming HP webOS products. To unsubscribe, reply to this message, with “unsubscribe” as the subject line. Hewlett-Packard Company, 950 W Maude Ave., Sunnyvale, CA 94085-2801.